Ethiopia Stifles Dissent, While Giving Impression Of Tolerance, Critics Say : Parallels For authoritarian regimes, crushing all opposition can be bad for your reputation. Ethiopia's leaders have proven skilled at maintaining firm control while staging the ceremonies of democracy. 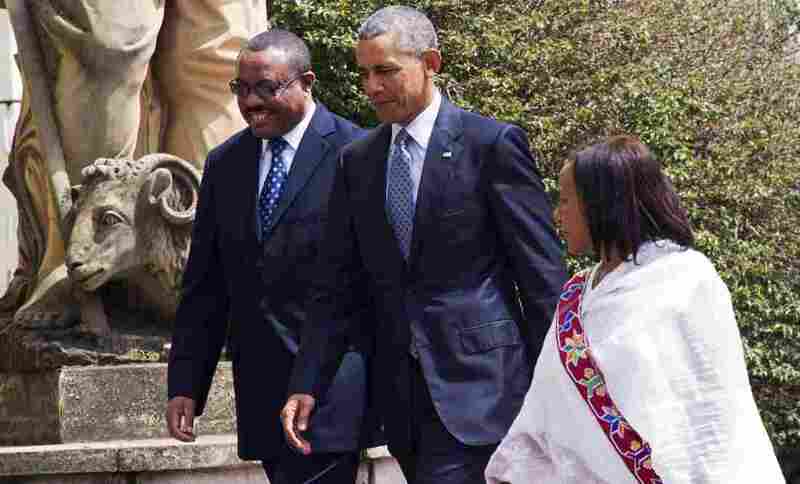 Ethiopian Prime Minister Hailemariam Desalegn (left), walks alongside President Obama during the U.S. president's visit to the African nation last July. Critics say Ethiopia has cracked down hard on the opposition, but makes modest gestures to give the impression it tolerates some dissent. The deputy chairman? Prison. The party secretary general? House arrest. The assistant secretary general? In prison. Six members of the party's youth league? All in prison. Critics of the Ethiopian government regularly land in prison. So why isn't Merera Gudina, the chairman of the party and an outspoken critic of the regime, also behind bars? The reason, he says, is what he calls "the game of the 21st century." Less-than-democratic regimes are getting more sophisticated, and instead of completely crushing dissent, they seek to create the appearance of tolerance or even a multiparty democracy, explains Merera. (Ethiopians go by their first names). In the case of Ethiopia, a strategy was laid out by the late former prime minister, Meles Zenawi, after the 2005 election, in which opposition parties won 32 percent of parliament and appeared poised to challenge the government. "Wait for the opposition to grow legs," Meles said in a meeting with top party officials. "And then cut them off." Merera says he is the current example of that strategy. He describes himself as a "floating head," while the legs of his party — all his deputies, his candidates, his organizers — are either imprisoned or threatened. Human rights groups are extremely critical of Ethiopia, but it is a member of the international community in good standing. President Obama paid a visit in July of last year, the first ever by a sitting U.S. president, and held a press conference with Ethiopia's Prime Minister Hailemariam Desalegn. "We are very mindful of Ethiopia's history, the hardships that this country has gone through," Obama said. "It has been relatively recently in which the Constitution that was formed, and elections put forward a democratically elected government." A number of human rights groups criticized Obama, saying he should have pressed much harder. Shortly before Obama's visit, Ethiopia released several noted opposition journalists and politicians. The deputy chairman of the Oromo Federalist Congress, Bekele Gerba, was among those freed, and he promptly flew to Washington to sound an alarm bell. "Every one of us is in a very high risk," he told NPR's Michele Kelemen. "Because anybody who criticizes the government is always a suspect." Bekele said his wife, a high school teacher, was also forced out of her job because of his politics. Bekele declined to use this trip to the U.S. to stay and apply for asylum. Instead, he said, he was determined to go back to Ethiopia, no matter what would happen. Soon after his return, Bekele was arrested again, and remains in prison today. Bekele is considered a moderate and he counsels nonviolence. He used his free time in prison to translate the writings of Dr. Martin Luther King, Jr.
Merera, the party leader, says that targeting Bekele has a boomerang effect. "When you are suppressing the moderate voice, then what you get is the radical voice," he warns. The arrest of moderates inside the country may be amplifying more radical rhetoric in the diaspora, such as rhetoric about "government overthrow" that Ethiopian officials are quick to highlight. Genenew Assefa, a government spokesman, points out that Ethiopian opposition "tends to be extremist," but also takes his own Justice Ministry to task for arresting so many opposition members. "And then we put them in jail, and then it's a vicious circle," he says with a sigh. "And this is how it works. I personally, you know, would like to deal with this differently." He says that he would like Ethiopia to counter criticism with politics, not with police. But Ethiopian politics appears to be moving away from democratic freedoms, not toward them. In last year's election, the ruling party won 100 percent of the seats in parliament. Even the "floating heads" no longer have a token parliamentary seat. Merera says that the Ethiopian strategy isn't working. "You can't arrest everybody," he says. He says that what is brewing is "an intifada (uprising), an Ethiopian intifada — even now, they don't need leadership." Last November, ethnically Oromo regions of the country erupted in popular protests. Activists say 350 people have been killed, and thousands more arrested. There's a growing fear that Ethiopia's "cut off the legs" strategy is splitting the country.